After negative reporting of his religious views, the Christian evangelist father of Ted Cruz has returned to the campaign trail in an effort to win evangelical voters in Indiana, whose primary Tuesday is regarded by many as the Texas senator’s last hope to keep his bid for the Republican presidential nomination alive. While the national media largely has been silent about Rafael Cruz’s re-emergence, local reporters in Indiana have covered his various appearances. WSBT-TV in Mishawaka, Indiana, reported Rafael Cruz created “a lot of excitement” by showing up as a guest of Indiana Republican Gov. Mike Pence at a Wednesday night fish fry dinner of Kosciusko County Republicans. On April 8, the Courier-Times in New Castle, Indiana, reported Rafael Cruz stopped by a local restaurant for an event that opened with a prayer from pastor Randy Gross and the singing of “God Bless America” by Christy Stutzman, the wife of Marlin Stutzman, a candidate for the Indiana state Senate. Rafael Cruz said Washington didn’t need someone who was willing to buy out people to get things done, referring to his son’s Republican rival, Donald Trump. “We do not need a deal-maker in Washington,” Rafael Cruz said. At one point in his speech, Yaeter noted, Rafael Cruz discussed the four different ways for Christians to decide who to vote for in an election, stressing that to vet a candidate, the voter must look at the candidate’s record, whether he is an able man, a man of truth and if he hates covetousness. The organizer of the event, Andrew Phipps, a national radio minister, urged the more than 10 pastors from around central Indiana in attendance to endorse Cruz for president, as Phipps suggested he had already done. BeliefNet.com notes the importance of religion in Indiana, with 31 percent of the population reported to be white evangelicals. The Chronicle-Tribune reported Rafael Cruz received a standing ovation when he told the crowd to “stop electing the village idiot” and made numerous jabs against Republican front-runner Donald Trump’s statements on greed and abortion. The newspaper noted that Rafael Cruz stated multiple times he believes the Constitution is based heavily on the Bible. On April 19, the Journal Review in Crawfordsville, Indiana, reported Rafael Cruz held a private “meet and greet” with approximately 20 local business leaders, faith leaders and students at the Joshua Tree coffee shop. According to the newspaper report, Raphael Cruz explained why he believes his son would make the best president and outlined some of the senator’s platform, including his stances on issues of faith, life, religious libertiy and the Second Amendment. “And that’s what our country’s based on,” she said. "Ted Cruz's Dad: My Son Ran for President After God Sent His Wife a Sign"
"Ted Cruz’s Father Worked With Supplements Maker Sued by Investors"
It is Cruz's brand of religious affiliation that scares me the most about him. What I want to know is where is mom Cruz? 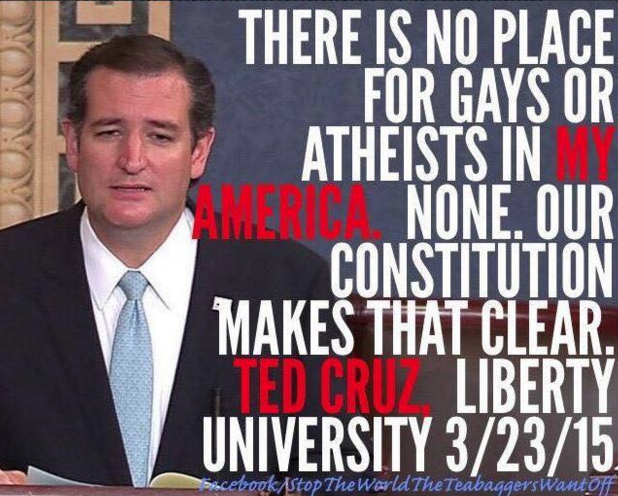 What are Americans to make of Cruz's statement behind closed doors to a group of believers??? "So now Ted Cruz appears to be the Republican Party’s best chance to save itself from Donald Trump....but putting Cruz at the top of their ticket is as dicey as Trump—and more dangerous. "